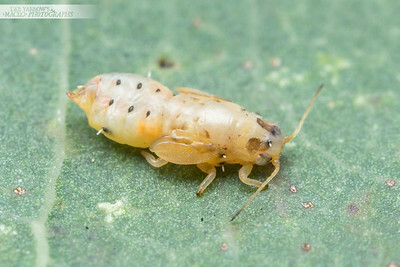 Portrait of a psyllid nymph on my scaly finger skin. Woodgate, Qld. 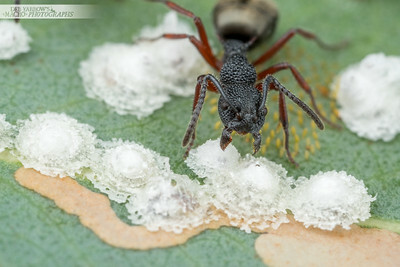 Dolichoderus ant tends her little lerp factory on a gum leaf. There is a clutch of tiny orange eggs directly under the ant. Girraween NP, Qld. 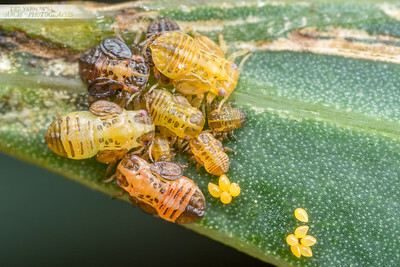 Tiny psyllid nymph (the orange blob) on a gum leaf surrounded by 'giant' Doli ants tending lerps. Girraween, Qld. 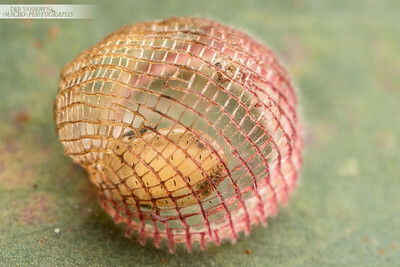 A delicate shell shaped basket lerp on a gum leaf. 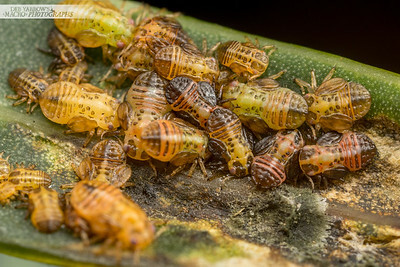 The nymph seems to be dead and parasitised. Minden, Qld. 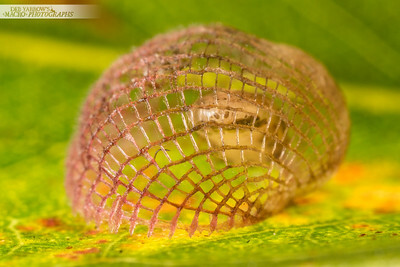 A delicate shell shaped basket lerp on a gum leaf. The nymph is the large whitish shape out of focus bottom left. 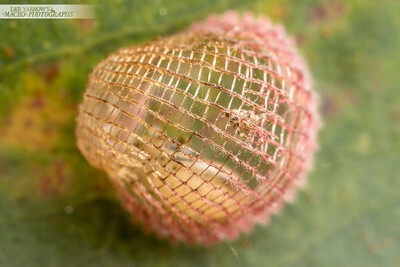 The thing centre right seems to be shed skin from an earlier instar. Minden, Qld. Bunched up for warmth on a winter day. Laidley, Qld. 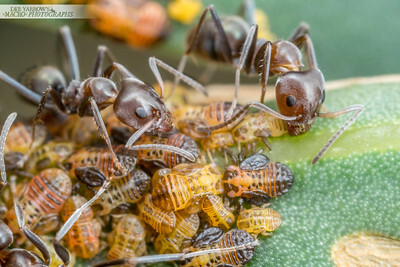 Meat ants tend to a brood of jumping plant lice, collecting honeydew and keeping them safe. Laidley, Qld. 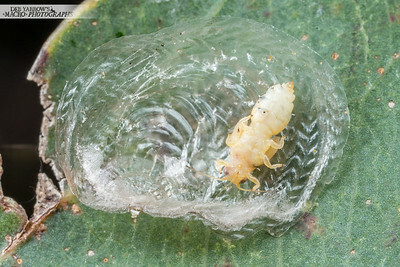 Psyllid adult, centre, surrounded by nymphs and an attendant Iridomyrmex ant. Bottom left are psyllid eggs. Laidley, Qld. 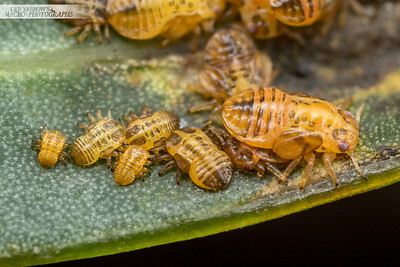 This brood of jumping plant lice (Psyllidae) do not build lerps and cluster together on leaves. Laidley, Qld. 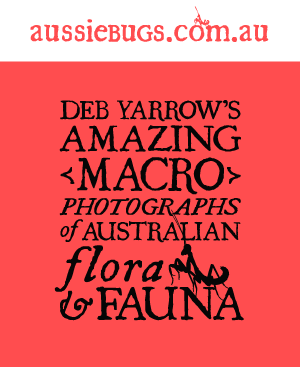 Fancy some fungus? Laidley, Qld. 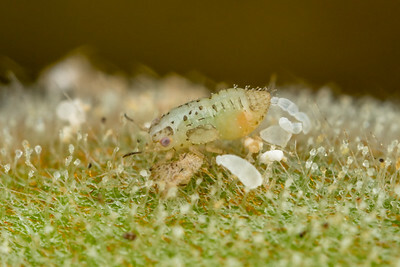 Psyllid seems to have been parasitised and is now a neat puparium. Moggill, Qld. 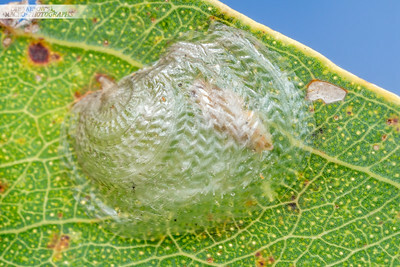 An intricately patterned lerp on a gum leaf covers a deceased psyllid nymph. Bellbowrie, Qld.